Within easy reach of the city centre and a short walk to Brighton's famous North Laines, this is a beautiful two bedroom apartment, with separate, private, entrance. It is tastefully decorated in a contemporary style, providing a peaceful, calm location for a memorable break. A beautifully presented, luxury, extremely spacious, two bedroom flat in Brighton, with a pretty patio area for alfresco dining. It is in a peaceful location, about one and a half miles from the seafront. Free on street parking. The accommodation comprises of, two double bedrooms, one with king size bed and single sofa bed, the other with double bed; a luxury shower room; utility room with washer/dryer; an open plan living area, with fully equipped kitchen; dining area with table and 7 chairs and a comfortable lounge area with double sofa bed; television, DVD, wifi etc. There are folding doors, which open to a pretty decked area with a BBQ, providing a wonderful inside/outside space for your use. All linen and towels are provided. As regular travellers ourselves, we have tried to think of everything necessary to make your stay as comfortable as possible, with a very well equipped kitchen. To welcome you on your arrival you will find fresh flowers, tea and ground coffee, fresh milk and biscuits which we hope will set the tone for a relaxing break. Preston Park Station is a 6 minute walk away with regular train services into London that take under an hour . The South Downs and downland villages are within easy reach by car or you could take the bus. There is a bus stop two minutes walk away with buses into Brighton centre every 10 mins. You can explore everything the region has to offer by bus, the South Downs National Park – and far beyond! From rambling and sports events to browsing local markets or enjoying picnics with amazing views, there are plenty of great days out in the region. Nestling between the South Downs and the sea on the South Coast, Brighton Centre is only 1.5 miles and the stunning City can offer you everything, with a mix of Regency Heritage and seafront cool. A cosmopolitan mix of award winning restaurants and bars, theatres and historic buildings, Brighton is one of the most vibrant, colourful and creative cities in all of Europe. Brighton is perfect for a break any time of the year. We are Julie and Bruce, we have lived in the City for many years and are proud of its vibrancy and diversity. We enjoy getting out and about walking and on our bikes, along the seafront or up on the downs. We are energetic and try to squeeze in as much as we can. Family is a large part of our lives and we love to spend time with them. Halcyon is perfectly situated in a pleasant tree lined avenue, reputed to be one of the finest in Brighton, it is within easy reach of the city centre and all it has to offer, local public transport, mainline train station (London less than an hour). On street parking is free (a rarity). Brighton is a great place to visit at anytime of the year. High quality bed linen. Sheet, duvet and covers etc. Clean linen provided weekly. Egyptian cotton, bath and hand towels provided, beach towels on request. Clean towels provided weekly. 4 seater sofa bed, 3 seater sofa, TV, dvd player. Full size intergrated fridge and full size integrated freezer. Fully equipped- saucepan set, frypans, serving dishes, cooks knife set, bottle opener, garlic press, cheese grater, serving spoons etc. crockery, cutlery, glasses, mugs, jugs, teapot and more. Table and chairs, comfortably seats 7. 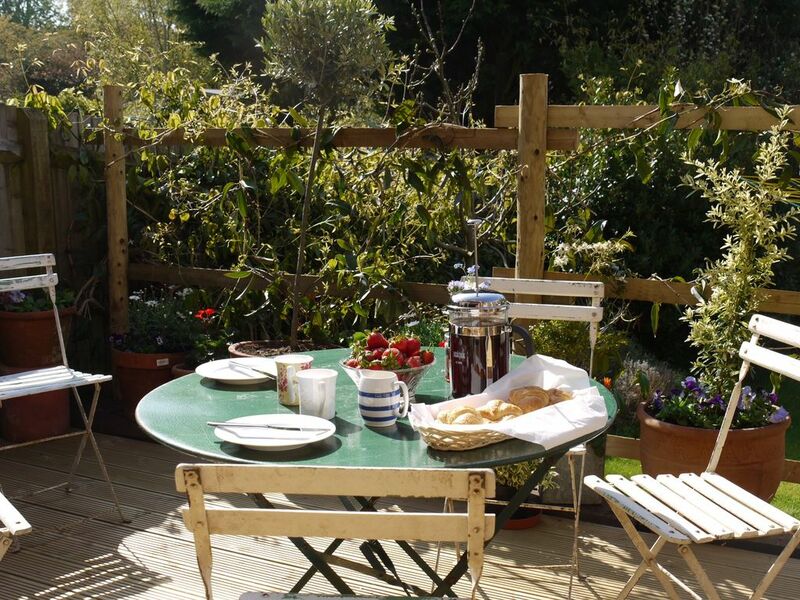 Pretty secluded terrace, with BBQ and table and chairs to enjoy alfresco dining. There are approximately 7 steps down to the front door of the property, once inside everything is on one level. Very nice place, we enjoyed the stay, clean and tidy. nice area of the city, quite and lovely. Julie was very helpful through out the stay. The kids will remember their city break for years to come. Thank you very much for your review, we are really happy that you enjoyed your stay with us. Thank you for your review, it was lovely to meet you both. What a lovely first visit to Brighton we have had, the weather has been glorious. We are so pleased that we stayed in this accommodation, it was perfect for our needs. The location is great, a lovely area with nearby local shops and a great gastropub a few minutes walk away. It was very easy to travel into Brighton on a short bus ride or to walk. The apartment is beautiful, spacious, very comfortable and clean with everything we needed. We were warmly welcomed by Julie and were able to contact her should we have needed to. Thank you for a lovely stay and we shall definitely return here in the future. Thank you for choosing to stay at Halcyon and for the lovely review. We are so glad you enjoyed your stay, it was lovely to meet you. We look forward to seeing you again. Julie and Bruce. Preston Park station is a 5 minute walk away with regular services into London that take under an hour. The South Downs and downland villages are within easy reach by car or you could take the bus.